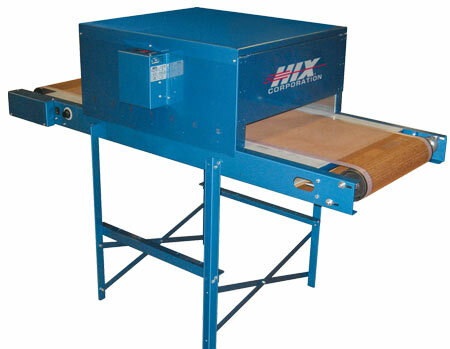 The HIX VS-2255 dryer is for screen printers who are just starting up or are on a tight budget. This compact dryer is built with the HIX standard for quality and reliability and provides all of the basic needs to cure plastisol inks. The VS-2255 comes standard with digital temperature controls and boasts a large 22" opening for large garment curing. This dryer is not recommended for high moisture/water-based inks. The HIX VS-2255 conveyor dryer utilizes infra-red heat panels to cure with less risk of scorching than coral tube systems. All of our dryers are manufactured with the same level of craftsmanship and durability, regardless of price.